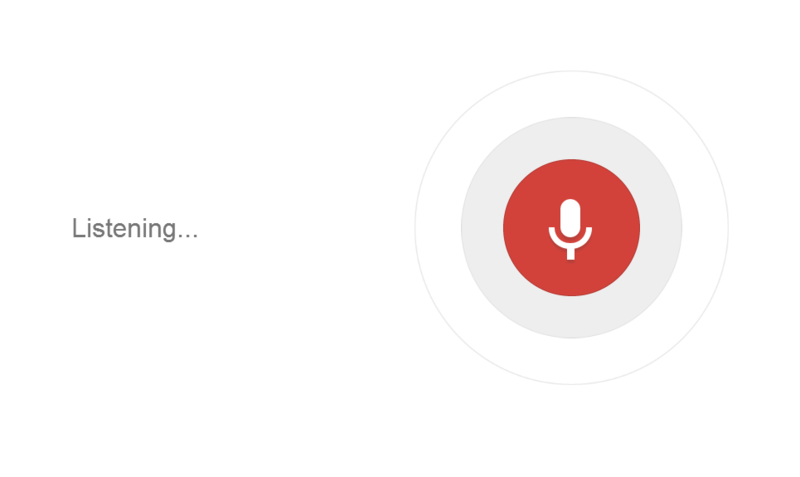 Hands on with Google conversational search: Is it time to start talking to our browsers? It’s almost like we’re living in the future with voice-activated search, now made far cooler with an artificially intelligent algorithm that talks back to you. Even before Google announced the update at Google I/O, the tiny microphone icon that sits on the far right corner of the search bar was there – has been for the past two years. It just wasn’t as sophisticated prior to the recent update, and not quite as fun to use as it is now. We’ve seen natural language processing technology, the extremely complex building blocks that make up Google’s conversational search, in similar services like SIRI – developed by the SRI International Artificial Intelligence Center – and in other products like Google Now. It’ll be years before natural language processing is sophisticated enough to understand irony and sarcasm within context, and a lot of work and research will have to be done to reach that end, but the latest application of this technology in Google conversational search is exciting. Why? Well Google conversational search now talks back … and while that’s only the beginning, it’s a good place to start. 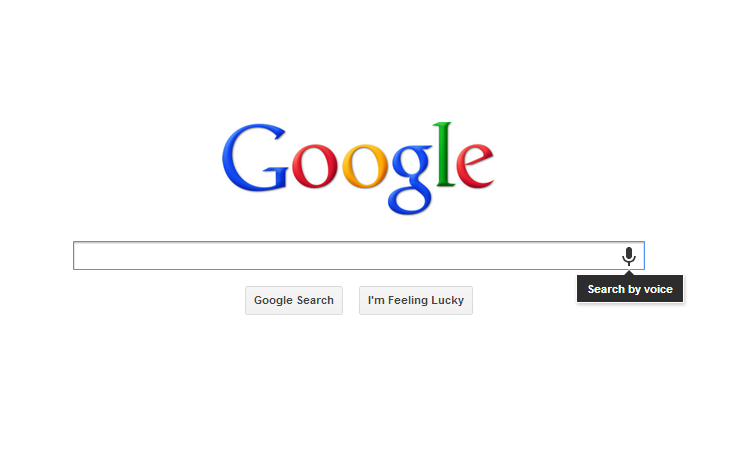 To get started on the vocal Google search, you’ll need the latest version of Chrome, version 27. Head to the menu tab and click on “About Google Chrome” to make sure. By this time, opening the tab will either let you know that you’ve got the latest version of Chrome, or it’ll automatically start the update. Once all has been done, click on the microphone icon. That should open up a brand new splash page that asks you to “Speak Now.” What’s cool about this part is that as you speak your search query into your microphone, Google will display what you’re saying in real-time on that page and try to fill in the blanks on what it thinks you’re searching for using its Autocompete functionality. Word of advice: if your default mic doesn’t pick up on sound too well, use an external mic. I asked Google, “Who is Alan Turing,” and normally you’d simply get the search results and that would be it, but this time a female voice – an option that’s set and unchangeable by default – ends up speaking back the Wikipedia excerpt describing the mathematician. While for the most part, I didn’t encounter too many incorrect searches using Google conversational search. However, I really tried to test the limits of the search engine’s natural language processing technology and encountered a couple of snags, particularly when it comes to proper nouns. For instance, I asked, “Who is the creator of the GIF?” Now, everyone knows that GIF is pronounced “JIF,” (some of us are still dealing with that fact) but I figured I’d try both the hard and soft “G” pronunciations. Google ended up processing these as “Who is the founder of the gifts?” and “Who is the founder of the GS?” instead. Still, unless you’re actively trying to confuse the technology, it will recognize nearly every word you say. In one instance Google even “corrected” my mispronunciation of “elephantitis” and was still able to understand what I was searching for. A few warnings that need to be noted is that there’s a very slim margin of error that Google offers when it comes to speaking a search query. You only have a few seconds to speak, and stumbling over or repeating words will confused the search engine, or will provide an incomplete or double-worded search query. And don’t forget to enunciate your words. Historically, search engines have been matching keywords to surface relevant URLs; implementing Knowledge Graph signaled Google’s evolution. In addition to link-based results, with Knowledge Graph Google serving specific-answers like the ones you see in the cards either on the right-side or top section of the search results page. When it comes to conversational search, Google uses natural language processing capabilities to break each spoken word down to the semantics and relationship of these words within the context of the complete sentence. 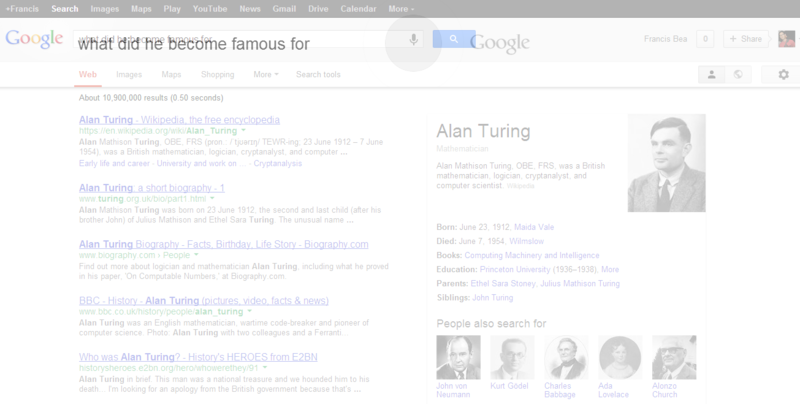 For example, when I asked “Who is Alan Turing?” Google was able to recognize that Alan Turing is a person, and because Alan Turing’s personal information has been indexed by its Knowledge Graph, Google was able to play back a rather specific answer (not just a link) courtesy of Wikipedia. Q: Who is Alan Turing? A: Alan Turing was a famous and influential mathematician and computer scientist. Q: When was he born? When you got to your second question, you wouldn’t start over again – i.e., “When was Alan Turing born?” You’ve already introduced the subject of you conversation, with this person, you don’t need to go it again – same goes for Google conversational search. 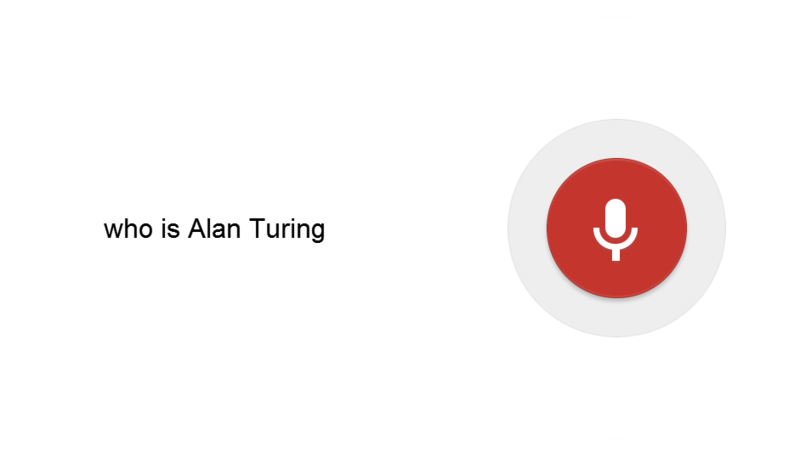 So after following up my first question, “Who is Alan Turing?” with “What did he become famous for?” Google recognized that the pronoun “he” in the second question was directly referencing Turing’s name. That’s how people would do it, so Google’s trying to do the same. 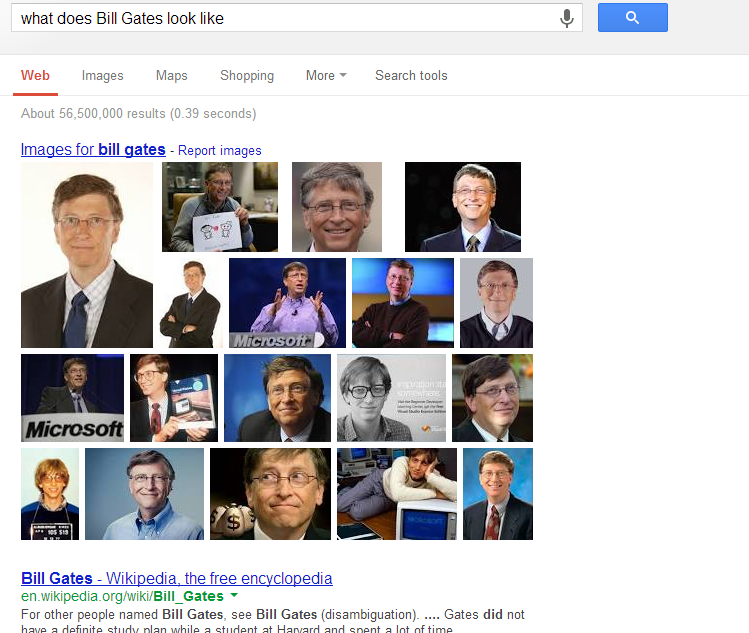 You can go from here too – until you start a new query, Google will keep up with the subject. Don’t try the conversational way of searching if you’re planning on typing your queries. You’ll find that following up initial queries with pronouns just doesn’t work. Not every answer can be read back. Movie listings may play back with the exact theater location, but finding places to eat, on the other hand, in most attempts simply listed search results, without being read back. 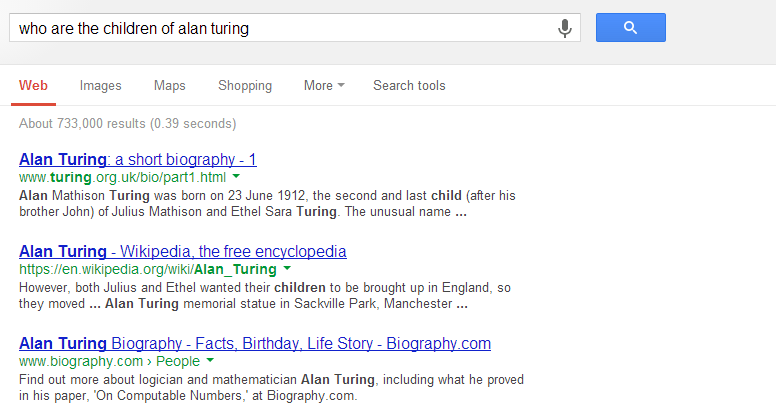 So while Google might be able to read me Alan Turing’s birthday and show me the Knowledge Graph card at the top of the screen with the answer, asking for the names of his children simply gave me the usual list of URLs that may point me in the right direction of an answer but nothing more. One reason for this is that what ends up being read by Google heavily depends on whether the answer is indexed by Google’s Knowledge Graph. Alan Turing’s children might not be read back, but Lindsay Lohan’s sisters sure will. It just depends on what the Knowledge Graph has accumulated – which has a lot to do on what the world is most often searching for. If you’re lucky, you might see personalized responses – but it’s not a feature you can depend on yet. I tried asking Google about today’s weather without referencing my location, but it took a good eight seconds the first time around before the answer was displayed and read back. The second result was instant. The problem was that its algorithm was pulling from the wrong location. 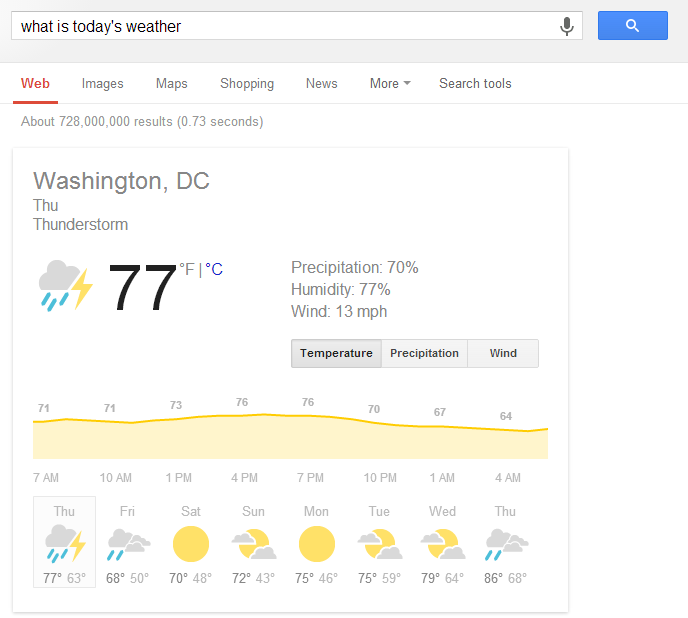 Despite being on a New York City IP address, Google ended up telling me today’s weather over 200 miles south in Washington D.C. 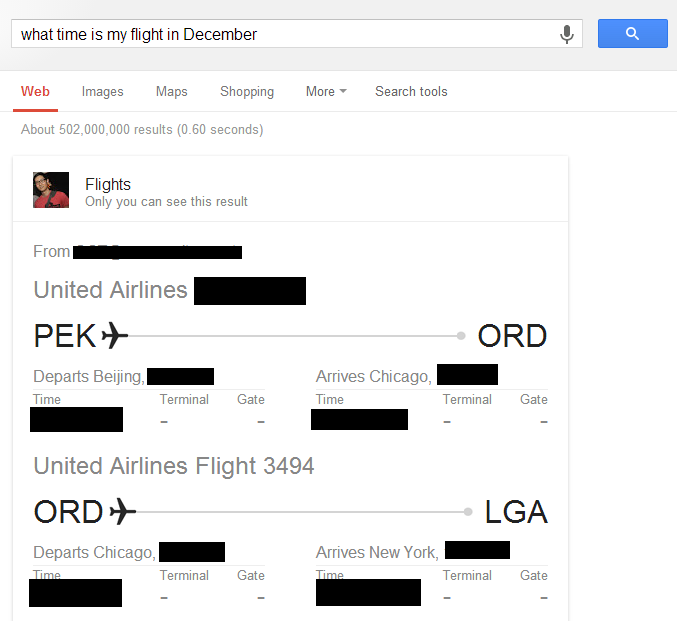 Since I’ve opted into the Gmail Search Field Trial, which means my Google account data – flight tickets, calendar, emails – is synced with Google search results where it applies, the personalized results actually were quite handy. Asking aloud “what time is my flight in December?” and “Pull up my emails with Molly” surfaced the relevant info at the top of the page. The novelty of voice-based search may attract users for a short time, and will surely be picked up by those with vision problems, but for everyday use it’s just not easier yet. Searching for one query takes several seconds longer than simply typing it out, and there’s the risk associated with misspeaking something. But we can’t hold it against the search engine; conversational search is in its early stages and the practical uses for an advanced version are endless.